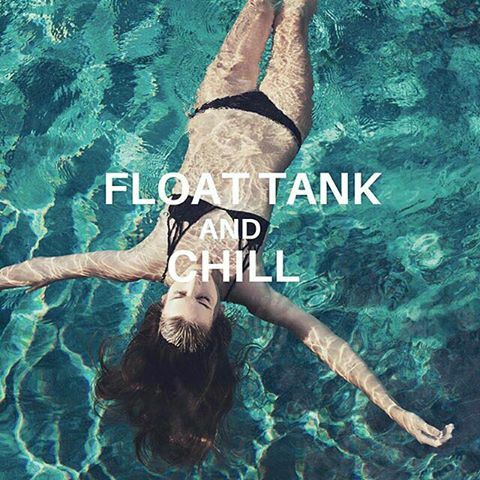 FLOATATION TANKS, THREE POWERFUL HEALING THERAPIES IN ONE! Floatation therapy is similar in concept to the dense mineral saltwater at the Dead Sea in Israel. 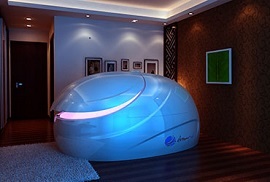 Multiple therapies are occurring when you’re in a floatation tank. First and most obvious is the reduction of gravity. A 1/2 ton of magnesium sulfate, Epsom salt is dissolved into a shallow pool of skin-temperature water to create this effect from floating, only deep sea divers and astronauts are able to enjoy this break from gravity’s pressure. The magnesium sulfate is a mild muscle relaxant, which contributes to the deep relaxation experienced while floating. When you float, your brain responds to this deep relaxation by releasing endorphins, which help to relieve pain, improve mood and boost T-cell count (improves immune system). Lying back, you float effortlessly on the surface with all parts of your body firmly supported. Your muscles no longer have to fight against the constant downward push of gravity, the single greatest cause of wear and tear to bones, joints and body tissue. As muscle tension melts away, you find yourself floating weightless and free, like an astronaut in zero gravity conditions.Scientists estimate that up to 90% of the brain’s normal workload is caused by the effects of routine environmental stimulation the combined effects of gravity, temperature, touch, light and sound on the muscles, nervous system and sense organs of the body.The float tank screens out these external physical stimuli, creating a pure state of “sensory” relaxation. Under these unique conditions your body has a chance to restore its natural powers of self regulation, while you simply lie back and rediscover the latent abilities of a deeply relaxed mind. While you are floating, your ears are below the surface of the solution, cutting out external sounds. Many people, however, find that gentle ambient music accelerates and intensifies the relaxation process. The float tank’s powerful underwater speaker system creates the feeling that you are floating in a sea of music, enhancing the rich dream-like quality of the experience.”Most importantly, the float tank is not a hypothetical laboratory phenomenon, but a viable, proven technology” Dr Henry Adams, NIMH, Washington. The pleasures and perks of the modern float tank are based on a revolutionary scientific approach to deep relaxation called Restricted Environmental Stimulation Technique or R.E.S.T. for short, first developed back in 1954 by researchers at the NIMH (National Institute of Mental Health) in Washington. I recently read about the Dallas Cowboys using float tanks in the 1980’s to enhance healing of injuries through a treatment that is free of gravity. I tried the treatment several times and found each time to be refreshed, rested, I slept better and had more energy.Floating creates a twilight zone of creative, inspirational thought processes, where your learning abilities are at their highest and powers of visualization and auto-suggestion are greatly enhanced. Measurements of the brain waves produced by experienced zen meditators in deep satori show large amounts of theta activity across the cortex. For most people, however, the theta state is almost impossible to enter without falling asleep. In the tank you enter this elusive state effortlessly and enjoyably, and stay in it for most of the float session. Time seems to vanish.Third and most unique is the fact that floating quickly changes the brainwaves from beta to theta, which is where accelerated healing occurs. If someone suffers arthritis, migraines, chronic pain, hypertension or insomnia, they’re probably not getting the benefits of theta when they’re sleeping. This is the reason why many people claim that 1 hour in the float tank feels like 4-8 hours of quality sleep; they’re enjoying the beneficial theta state in a fraction of the normal time needed. The parasympathetic response is the body’s natural mechanism for healing and regeneration. It can only occur during deep relaxation. Floating is the fastest, easiest and most effective way of eliciting this response and enjoying its dramatic health benefits. Floating “re-sets” the body’s chemical and metabolic balance, strengthening its resistance to the effects of stress, illness or injury.When you change your body, you also change your mind. The de-activation of the nervous system has a direct effect on the hypothalamus, the brain’s chemical control center. Recent research has shown that internal events (thoughts and emotions) are then translated into measurable changes in body chemistry, and vice versa. The production of endorphins and the removal of undesirable chemicals during floating stimulates feelings of confidence, happiness and well-being, which helps you pursue your goals in life with maximum vitality and vigor. FTA states,”Carl Lewis, said to be the world’s greatest athlete, used in-tank visualization techniques to prepare himself for his gold medal long jump at the 1988 Seoul Olympics: the Dallas Cowboys, winners of the 1993 Superbowl, have been using float tanks since 1981 to develop the physical and psychological skills of their players; the AIS (Australian Institute of Sport) has been using tanks to train their successful Olympic squads since 1983. In the words of Jeff Bond of the AIS: “The floatation tank represents a new dimension in sports training for the elite athlete”.Floating maximises the benefits of fitness training and work-outs. High intensity exercise stimulates the muscles to grow, but the actual growth and strengthening takes place during relaxation – usually 30 to 40 hours after the stimulation occurs. 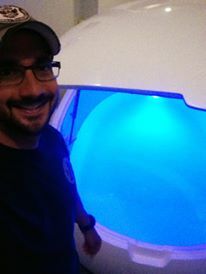 The deep relaxation of the float tank improves circulation and accelerates the growth and regeneration of muscle tissue.Strenuous physical exercise can cause a rapid build-up of lactic acid (a toxic by-product of anaerobic glycolysis) in the muscles; this is experienced as pain, fatigue and cramps which can last for days; it is also linked to the feelings of depression and anxiety known as “post-game letdown”, which can even affect recreational joggers. 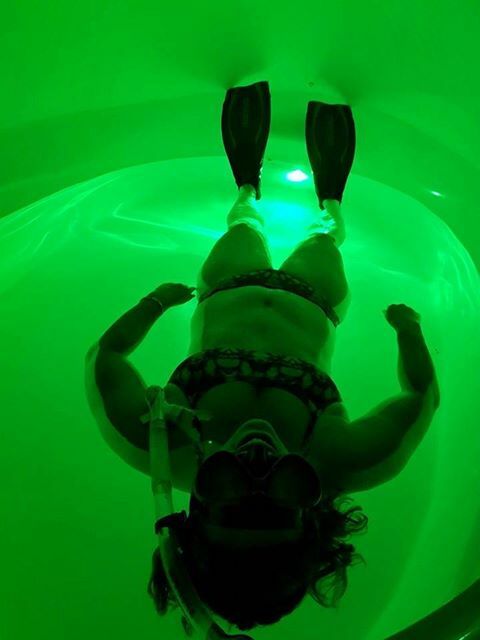 Floating is one method of reducing the effects of lactic acid and removing other waste materials from the body. This reduces the risk of over-training.Most sports injuries are not contact injuries but are the result of inappropriate muscle tension. Floating has been shown to loosen the muscles and give athletes a greater degree of control over their autonomic nervous systems, reducing the risk of injury during training or competition. Even when injuries occur, floating speeds up recovery and the endorphin effect alleviates the pain.Peak athletic performance depends on a combination of physical, mental and emotional skills. Modern training methods focus on helping the athlete to master “the inner game”, to develop that cool synchrony of mind, body and emotion which is the hallmark of a champion. The most potent psychological technique for building up skill and confidence simultaneously is visualization; in the tank, an athlete can achieve the level of concentration necessary for visualization to have a dramatic impact on performance. This is one of the hottest new developments in sports science. We are open in Cockburn, Western Australia. Narelle Gaunt2016-07-24T13:43:42+00:00July 24th, 2016|Float Tank News, Health, Mindfulness|Comments Off on FLOATATION TANKS, THREE POWERFUL HEALING THERAPIES IN ONE!